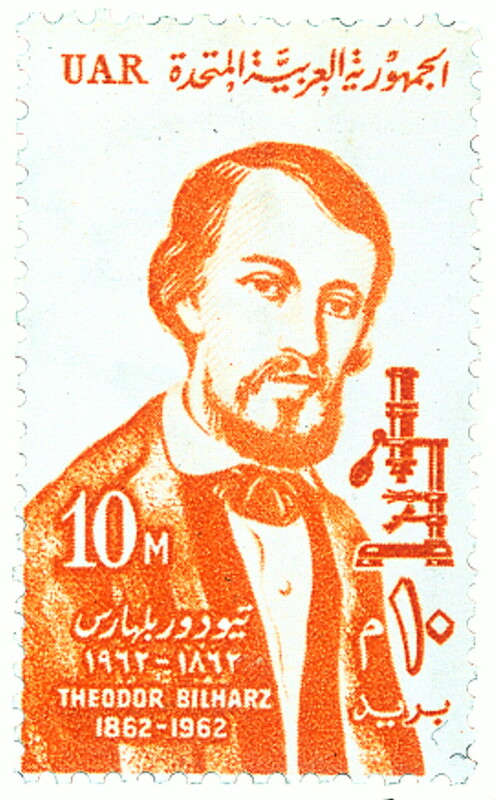 The German physician Dr Theodor Bilharz graduated in medicine in 1848. In 1850 he left for Egypt where he became the first Chief of the Surgical Services and in 1853 Chief of the Medical Service at the Kast El Aini Hospital and Medical School of Cairo. In 1856 he was appointed Professor of Anatomy. He died six years later at the age of 37. In 1851 he discovered Schistosomiasis haematobium, the causative agent of schistosomiasis or bilharzia. Bilharzia is a disease of great antiquity. The bilharzia eggs have been discovered in the kidneys of mummies. Bilharz, who died in 1862, was philatelically honoured by the United Arab Republic on the centenary of his death (Stanley Gibbons 702, Scott 533).